We’ve gotten a fair amount of rain and wind in the Puget Sound recently, and even some snow in the mountains. It may not seem like it, but there’s still plenty to do in the garden. 1. This month is a great time to mulch the vegetable garden. Mulch will help prevent erosion, keep weeds at bay and insulate your plants during the cold weather. 2. 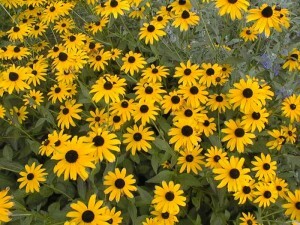 Divide perennials such as shasta daisies, asters and rudbeckia (black-eyed Susans). 3. Fertilize lawns late in the month to keep it green through the winter. 4. There’s still time to plant spring bulbs, such as tulips, daffodils and hyacinths. 6. Continue to plant or transplant perennials, shrubs and trees. Winter months provide ideal conditions for planting new shrubs and trees. 7. Rake leaves and add them to your compost pile, or use them to mulch your landscape beds. Leaves could be piled two to three inches high; over time, they’ll break down and add nutrients to the soil. Avoid using leaves of trees with diseases, or broadleaf evergreens such as rhododendron and laurel (since they take a long time to break down). 8. Avoid heavily pruning roses now. Wait until late February for major pruning. Protect roses by removing leaves, or letting the roses form seeds, or hips.